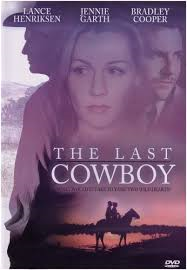 The Last Cowboy (2003) Rated UR | What to Watch. The actors give a strong performance in this quality Hallmark TV movie. Garth was surprisingly heartfelt in the lead role as the headstrong young woman who has dreams but struggles with her father’s influence over her life. Henriksen plays the stoic, stubborn father. In one of his earlier roles, Cooper seems out of place as the cowboy who tries to win Jake’s heart. Despite its formulaic storyline of tragedy drawing a family together again after a squabble alienates one member, Hallmark focuses on the process of learning to trust and love again in a meaningful way. This movie is worth a watch. This entry was posted in 2003, Drama, films, hallmark movies, Movie reviews, movies, Rated UR, reviews, Western and tagged actors, bradley cooper, Cowboy, dreams, Dylan Wagner, emotions, family, father, film, films, formula, hallmark, headstrong, heart, Jennie Garth, Lance Henriksen, life, love, M.C. Gainey, member, movie, Muse Watson, The Last Cowboy, tragedy, trailer, Trust, Tv Movies, woman, worth. Bookmark the permalink.